The court rejected the claim of the cash-strapped airline that any monthly pay to the pilot was contingent on completion of 70 flying hours. A Delhi court has directed the grounded Kingfisher Airlines to pay the outstanding salary of three months amounting to Rs 12.91 lakh (Rs 1.29 million) to one of its ex-pilots who had moved court over non-payment of dues. Additional District Judge Rakesh Kumar disposed of the case in favour of Captain Sanjay Sudan and declined the plea of the airline to be heard in the matter, saying having a counter-claim against the plaintiff (pilot) is "not a ground for grant of leave to defend". "This suit is decreed. 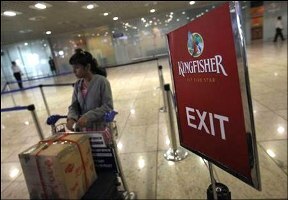 The defendant(Kingfisher airlines) shall pay a sum of Rs 12,91,035 to the plaintiff (Sudan)," it said. The court noted that Kingfisher had not disputed the amount of salary and the period for which it was due, as claimed by Sudan, and said 'in view of the provisions of Civil Procedure Code, the application (by Kingfisher) for leave to defend has been declined, the plaintiff is entitled to a judgement forthwith'. It accepted the contention of advocate Jasmeet Singh, who appeared for Sudan, that there was no flying taking place, as stated by the airline, then how could the company want him to complete 70 hours of flying. "Despite various oral as well as written reminders, personal visits and follow ups the defendant (airline) has failed and neglected to make the outstanding payment which is due and payable to the plaintiff and a decree for recovery of salary alongwith interest be passed in favour of the pilot," the court said. Captain Sanjay Sudan had filed the suit against Kingfisher Airlines seeking recovery of around Rs 13 lakh (Rs 1.3 million), his outstanding salary for three months from the airline. According to the suit, Sudan was employed by the airline as Transition Captain with effect from January 12, 2008 on a salary of Rs 430,000 per month which was subsequently raised and his last drawn salary was Rs 520,000 per month, October 2011 onwards. "The airline company was in terrible financial mess and was unable to pay salaries to most of its pilots and examiners, including the plaintiff and had not paid the salary for the months of December 2011 to February 2012," the suit said. It was further claimed that the plaintiff had no option but to resign on February 10, 2012, which was accepted by the airline in June 2012 and the salaries from December 2011 to February 2012 amounting to Rs 12,91,035 was admitted by the airline in its tax sheets showing deduction of tax.